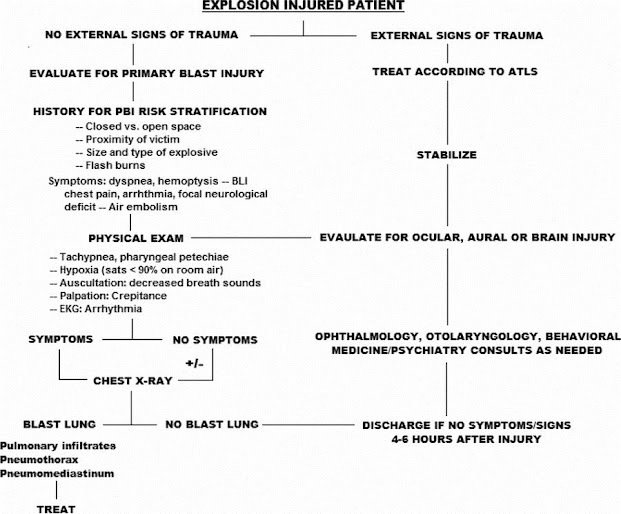 Clinical diagnosis of blast lung injury is based on the presence of respiratory distress, hypoxia, and “butterfly” or batwing infiltrates. Triad of immediate bradycardia, hypotension, and apnea. Mesenteric or mural hematoma in hemodynamically stable patients without peritoneal signs may be managed with NPO, NG tube decompression, and resuscitation. Massive hemorrhage or obvious hollow viscus perforation should be treated with laparotomy for hemostasis and control of spillage of enteric contents. PE should include a thorough NE to include checking for positive Romberg's sign as well as funduscopy to look for evidence of air emboli. CT scan should be used to search for evidence of blunt head injury and ICH.